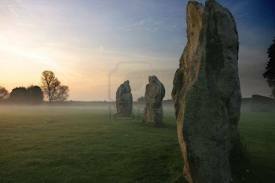 Happy solstice…or why I wish I were at Avebury with the throng. Yesterday was the Summer Solstice, June 21, 2013, the longest day of the year. The Summer Solstice always makes me think of two things, one memory and one question. First the memory: seven years ago we were visiting relatives in Wales. One beautiful sunny day my wife’s cousin Peter asked if we wanted to see the standing stones at Avebury. I had no idea what he was talking about, but I`m always up to see something new. Off we went. On the way he explained that the standing stones were the largest collection of prehistoric standing stones in Europe…bigger than Stonehenge but for some reason not nearly as famous. The closer we got, the more congested the small road got. I didn`t think anything of it until we came to a virtual standstill. Suddenly Pete let out a colourful expletive, followed by `Oh my God, Oh my God, it`s the %”*!$ing Solstice.` That`s when I saw them. Huge numbers of people: bikers, hippies, druids wandering with their children among these magnificent stones. It was a sight I`ll never forget and wished I was part of . . . I`ll also never forget the running commentary by Pete as he cursed `the great unwashed of Europe` who had descended upon his idyllic plans for the day. He refused to stop the car and I never did get to join the throng, but it’s still one of my favourite memories of a wonderful trip. Sometimes the best adventures are the ones that are unplanned. A few days later we got to Stonehenge where there were only a few very polite and well washed Druids performing some very beautiful ceremonies. I preferred my day with the throng – whom I suspect were actually better washed than I was during much of this trip. The second thing I think of on every solstice is a question: Why isn`t this the hottest day of the year? It has more hours of sunshine and more direct sunshine than any other day this year. BUT and it’s a big BUT, this isn’t the hottest day of the year. The sticky hot, wish you could take your skin off it’s so hot, days of August are still months away. Change takes time . . . even the earth knows it. The earth is still reluctant to fully surrender the cold that set in last winter; it lingers in the rocks, in the lakes, in the building, in the very soil itself. It hasn’t fully caught up to the warming influence of the longer days yet. I had a text message from a friend who’s been making some healthy choices for his body lately, he’s discouraged; he’s doing all the right things, but not losing any weight. It’s just not shifting. I feel for him, it’s tough and our bodies, like the earth, like our emotions, like our souls, like to linger in the past, in the comfort of the known. There are all kinds of theories around the subject of why change takes time, I personally think it’s the universe’s way of finding out if we’re really serious. Warmer days are coming. Have faith; if you’re doing the right things, if the light is shining, the world will catch up, it has to. There are going to be setbacks, there are going to be problems and some days are going to feel colder than others, but we will get there.